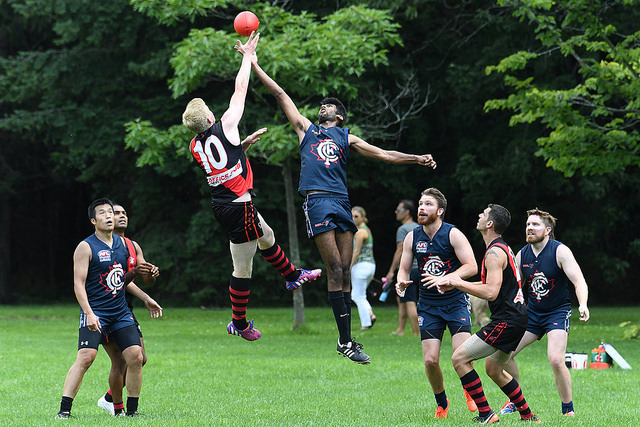 The Toronto Dingos got their second crack at the Central Blues in AFL Ontario round nine action this past weekend. The sides last met back in round five with the Blues coming out narrow victors (match report) and the Dingos were keen to make amends. Things got off to a bad start early with the Blues quickly able to apply pressure to the Dingos defensive line kicking two goals and four behinds in the first term. The Dingos were able to respond in the second though, with ruckman Tom Bell working well with Michael Ladd and Irish combination Ricky Nolan and Sean O’Reilly to get the ball moving in the right direction. 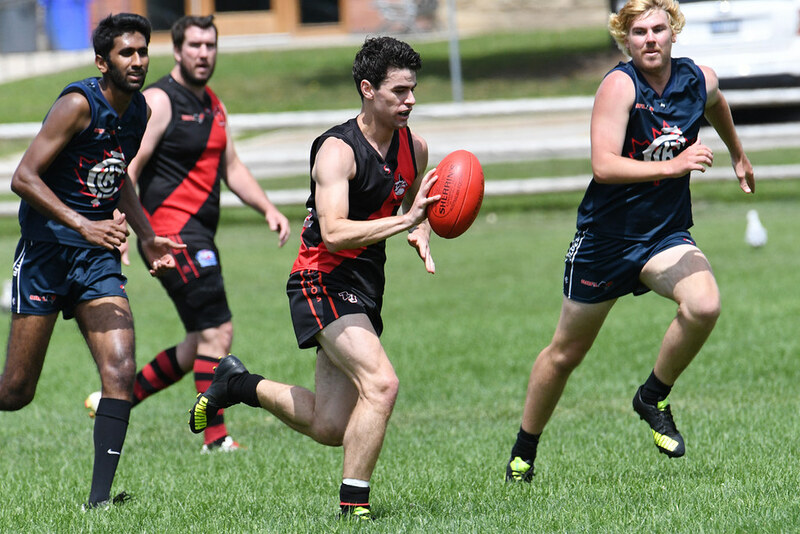 The Dingos forwards led by Rob McNaughton showed again what they are capable of when they get delivery of the football kicking three goals for the quarter. Meanwhile at the other end Tim Indian and Patrick Bossey were tireless in defense limiting the Blues to one goal for the quarter and putting the Dingos right back in it. At half-time this was shaping up as another arm wrestle between these two sides, with the Blues holding a narrow lead 3.6-26 to 3.4-22. In the third quarter the Dingos were able to get ahead early adding several more goals but a Blues response was not far away. A few defensive lapses as play was coming out of the midfield late in the quarter resulted in the Dingos lead being whittled away. Going into the final break the Dingos held a narrow lead 7.5-47 to 6.9-45. With the game up for grabs both teams came out hard in the final quarter. The Dingos were able to add another two goals, including one to late addition to this week's squad Thomas Santibanez-Espinosa. Meanwhile though the Blues added three of their own including a daisy-cutter from the boundary line to clinch the game in the final minutes. With the Dingos unable to get back on offense in the dying minutes the Blues came out the winners in this one 9.12-66 to 9.5-59. Patrick Bossey was awarded best on ground for his relentless efforts in the half-back line keeping the Dingos in it when the pressure was on and moving the ball forward quickly when opportunity came knocking. 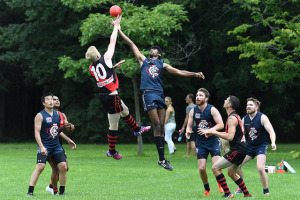 The Dingos must now turn their attention to Thursday August 3rd when they play the Toronto Eagles in their previously postponed round one fixture.